Every few weeks, I’m highlighting the lives of exemplary women as a part of the release of my new book ‘Old Money, New Woman’. 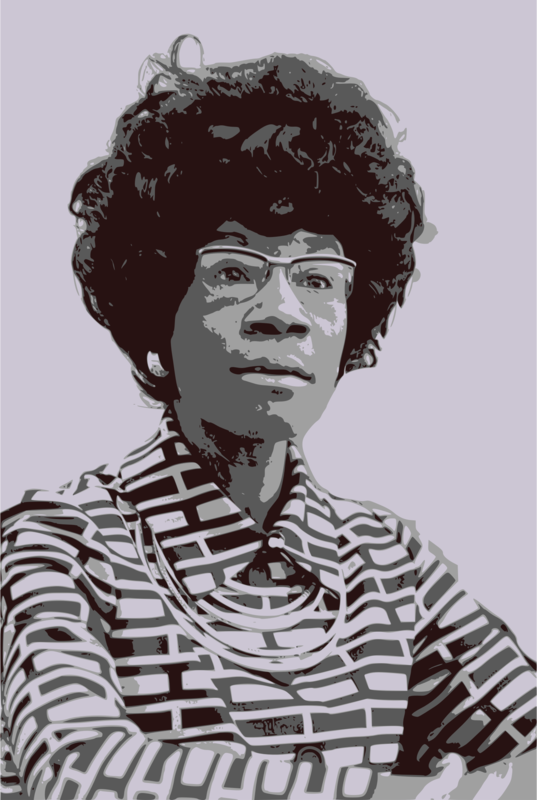 Today marks the birthday of the late Shirley Chisholm, a New York City native who committed her life to public service. Shirley Chisholm was born November 30, 1924, in Brooklyn, New York, but spent her formative years in Barbados with her grandmother. After graduating from Brooklyn College, she began her career as a teacher and then earned a master’s degree from Columbia University. During her years as a teacher, Ms. Chisholm began volunteering with the League of Women Voters and the Seventeenth Assembly District Democratic Club. In 1964, she ran for and was elected to the New York State Assembly. Ms. Chisholm was a member of the assembly from 1965 to 1968, where, among other things, she worked to get unemployment benefits extended to domestic workers. She also sponsored the introduction of the SEEK program (Search for Education, Elevation and Knowledge) which gave the state’s underprivileged students the chance to enter college while receiving intensive remedial education. She sponsored another bill which prohibited female teachers from losing tenure while out on maternity leave. In 1968, when she ran for and was elected to the U.S. Congress, where she served on several House committees including Agriculture, Veterans’ Affairs, Rules and Education, and Labor. During the height of the civil rights movement, she spoke out about the judicial system, police brutality, prison reform, gun control, and drug abuse, issues which we still struggle with today. Throughout her terms in Congress, she met with discrimination, both for being black and for being a woman. Still, when George Wallace, an outspoken opponent of integration and equal rights for blacks, was shot and wounded during his presidential campaign, Ms. Chisholm went to visit him in the hospital. She showed compassion for a fellow human being, even if his political beliefs were different than hers. Seeking to have an even greater influence on society, Ms. Chisholm ran for the office of the President of the United States of America in 1972. Although she did not win the Democratic nomination, she did win an impressive 10 percent of the votes within her party. She served in the U.S. House of Representatives for another decade, retiring in 1982. After leaving Congress, Ms. Chisholm made her home in suburban Williamsville, New York and resumed her career in education. She was named to the Purington Chair at the all-women Mount Holyoke College in Massachusetts. She also co-founded the Unity Democratic Club in Brooklyn and was one of the early members of the National Organization for Women (NOW) as well as being active in the National Association for the Advancement of Colored People (NAACP). She was inducted into the National Women’s Hall of Fame in 1993. “Unbought and Unbossed” was her campaign slogan, and she stayed that way all through her life and career. One positive thing about the internet is that we are able to learn about and be inspired by people in history that we did not learn about in school. I have always been curious about what else was happening in the world while the only information we had about a time period was what we found in our textbooks. Even though I spent a lot of free time at the library and reading everything I could, there is so much I missed. I think today’s younger people are at such an advantage because if they are curious they can easily find so much information, and from different viewpoints. Well, I see what you mean. if I use an admittedly small sample size of the young people I have talked to in the last week or so, I actually feel encouraged for the future! I was around several college age youths (relatives and their friends), and had a few great conversations about their philosophy class, history club, and plans for work over Christmas break. I also went to a high school play that was very entertaining, with some talented young performers. They are curious, and interested in what’s happening in the world, but they do have the feeling that learning something for the sake of possessing that knowledge is not too useful, since they can access it again anytime. To me that’s really different. Maybe it’s good if their schools focus more on discussion and scope than on learning the dates and small details that can monopolize students’ minds when they study. Oh, and one 19 year old was an intolerable, rude, immature nightmare. A product of poor parenting. C’est la vie. What a wonderful post. Can’t wait to read your book!